I know what you’re itching to know: did the Giulia Quadrifoglio break down during its nine months and nearly 17,000 miles with CAR? Well, three months in, on came an engine warning light, signalling ‘injection system failure’ or ‘catalytic converter damage’. Potentially. It followed a stint with CAR’s Group MD, who’s as hard on cars as he is on dubious expense claims, and the electronics had locked out the two punchiest drive modes (Dynamic and Race) as an engine-protecting precaution. But once I’d brimmed the Alfa with super unleaded, the red light mysteriously disappeared and the car never missed another beat. And you’re desperate to know how awful the dealer was… Well, we tried two. The first, Donalds in Peterborough, goofed by accepting a booking despite its technicians not having been trained to do the first service on a Quadrifoglio. So Glyn Hopkin in St Albans undertook it, speedily changing the oil and fluids for £345 – cheaper than the first service on my Discovery Sport. I was asked on three occasions for feedback on my experience, which indicates how focused Alfa is on trying to rebuild its reputation. These tales of the unexpected extend to how the Giulia Quadrifoglio drives: no car enthusiast could have dreamed it would be so wondrously, deliriously good. The biturbo V6 sounds magnificent and takes off like a Falcon Heavy, and the throttle response and steering are comically quick: after some days in the Jaguar XF, I jumped back into the Alfa and almost steered into a traffic island, having forgotten how immediately it responds just off dead-centre. The aggressive geometry does have a tiresome downside, though: near full lock the steering bucks and kicks like a rodeo horse. 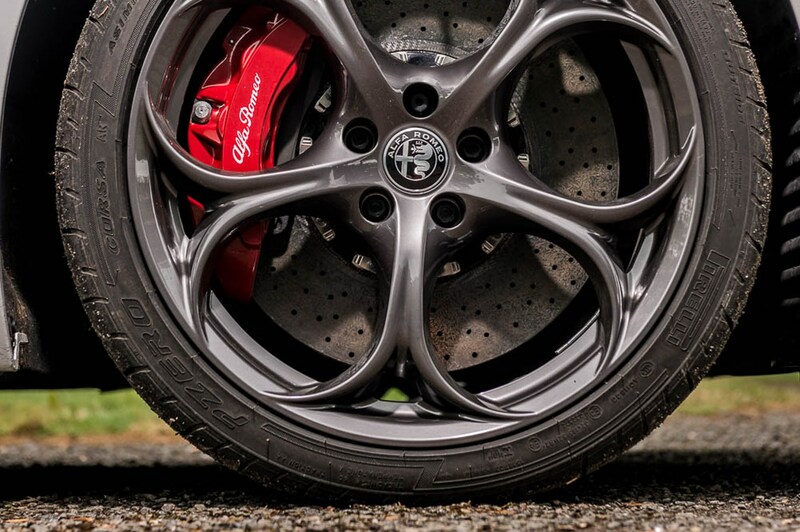 But my favourite aspect is the Quadrifoglio’s breadth of character. The ride is pretty supple and negotiates potholes elegantly, and in Advanced Eco mode, it cruises at 2000rpm with the charismatic exhaust muzzled and accelerator defused, and the hole in the fuel tank better patched. I still only averaged 23.1mpg, some 33 per cent off the official economy figure, despite trying to use Eco mode for A1 commuting. But there was plenty of delving into the thirstier Dynamic mode to unlock the hooligan alter ego. It’s not perfect. Four new Pirelli P Zero Corsas cost an almighty £1980. The carbon ceramic brakes were unnerving at low speeds (save your £5500), and I still don’t know how to enter a postcode into the rubbish infotainment system (bizarrely, voice input of towns was robust). And the editor once ran out of petrol because the range outlook went from 32 miles to ‘– –’ in an instant. But there’s a brand under reconstruction here and the Giulia Quadrifoglio is a fabulous first step on the road to redemption. John Cleland is at the wheel of his Vauxhall Cavalier Touring Car, chasing Tim Sugden's Toyota Carina E around Silverstone. Out of nowhere, an Alfa Romeo 155 enters stage right – backwards – slews across Cleland's path and into the gravel trap, which conveys driver Giampiero Simone helplessly into the tyre wall. Look on YouTube and you'll see the other 155 of Gabriele Tarquini barrel-rolling through the air at Knockhill, all four doors thrown open in flight like a butterfly's wings. It's chaotic, exciting stuff that sums up the British Touring Car Championship in its 1990s heyday. Every weekend Scott Austin would get home from his own saloon car races and watch each round, complete with frenzied Murray Walker commentary. Every smash, every overtake, every podium carved the Alfa Romeo 155 a little deeper into his heart. Today he owns five of them, including the mintest of 155 Silverstones, the homologation special for the 1994 championship. And I'm on my way to meet him in the most exciting Alfa Romeo saloon car since those days, the Giulia Quadrifoglio. The destination is Thruxton Motor Circuit, host of the '94 season's first race. Closing in on the track, the B3084 is deserted. I accelerate hard, the biturbo V6's pistons propelling the Giulia on its wave of surging speed, the exhaust bellowing, the overrun expelling gases with a gunfire rat-a-tat. 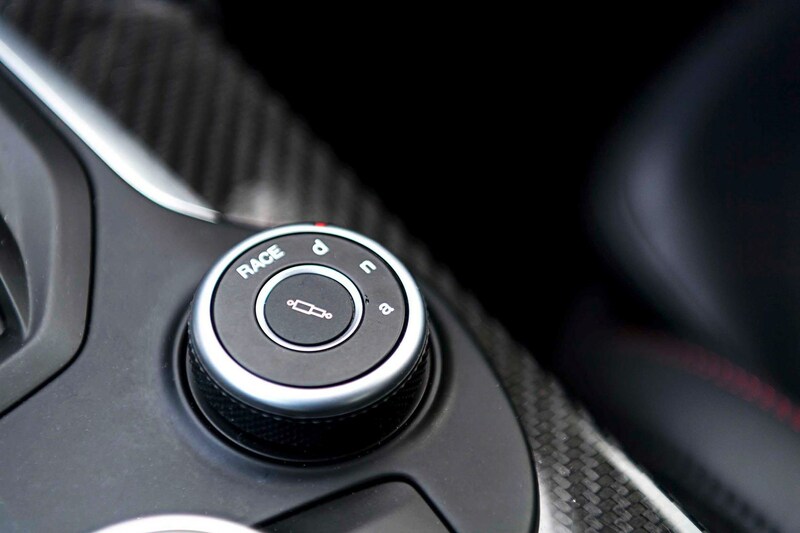 Clicking the crescent-shaped aluminium paddle imperceptibly slots the next gear: here we go again. I line up the Giulia for a long, sweeping parabola and keep feeding in the power, the car feeding back its unyielding grip. The A303 overpass looms, and I kid myself that this curve is the one emblazoned with 'Dunlop' at La Sarthe. Mate, this is a Hampshire B-road. 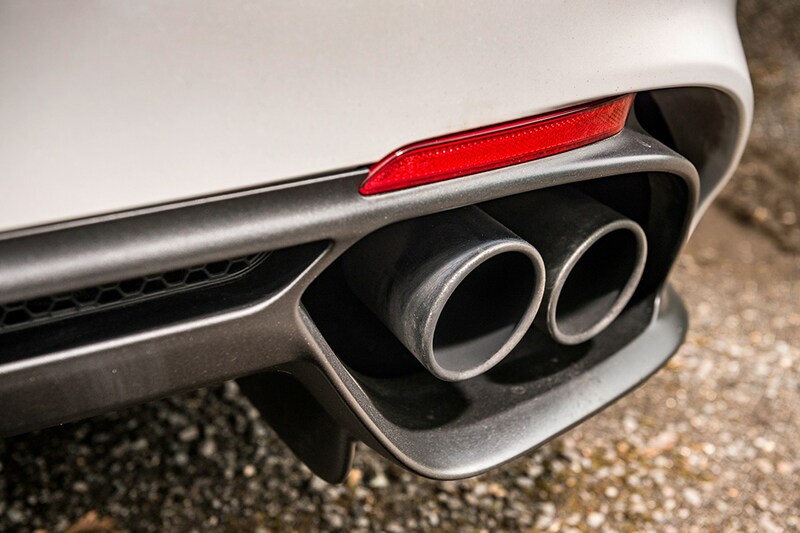 But it's easy to get carried away by the Alfa's sensations: its jink-jink steering, its begone-plodding-Astra overtaking rush, the exhaust's deep tuba blare. None of those pleasures have faded, even after nine months of stewardship. Scott's cherry red 155 is waiting just inside the circuit's perimeter. While the cab-backwards, rear-drive Giulia is clothed in curves, the 155 is all pronounced straight lines. Up front, the Giulia's teardrop LEDs wink at the 155's rectangular lamps, its vast shield grille dwarfing its forebear's. More fascinating still is comparing the aerodynamics. The 155 Touring Car was defined by its aero. The team's mechanics could extend its jutting front splitter and riveted rear wing in attack mode. It looks rudimentary today but it decimated the 1994 field. Tarquini took pole for five of the first six races, winning five of them. Ford and Vauxhall complained that the aero kit's angles did not mirror the 155 Silverstone homologation car's, leading to Alfa being docked points and flouncing out of a round in protest. But ultimately the points were restored, other teams were allowed to add wings and splitters – and Tarquini and Alfa Romeo won both that year's BTCC titles. Today's Quadrifoglio has an active front splitter; its action is reminiscent of a fish's mouth opening and closing. Motors separate the splitter to boost downforce in corners, then it becomes one streamlined whole to reduce drag on straights. The motorsport-style rear diffuser helps sucker those P Zero Corsas to the road, useful when they're agitated by 503 horses. Its cutting-edge bespoke aero was honed in the wind tunnel – the complete opposite of the 155 Silverstone's wing. 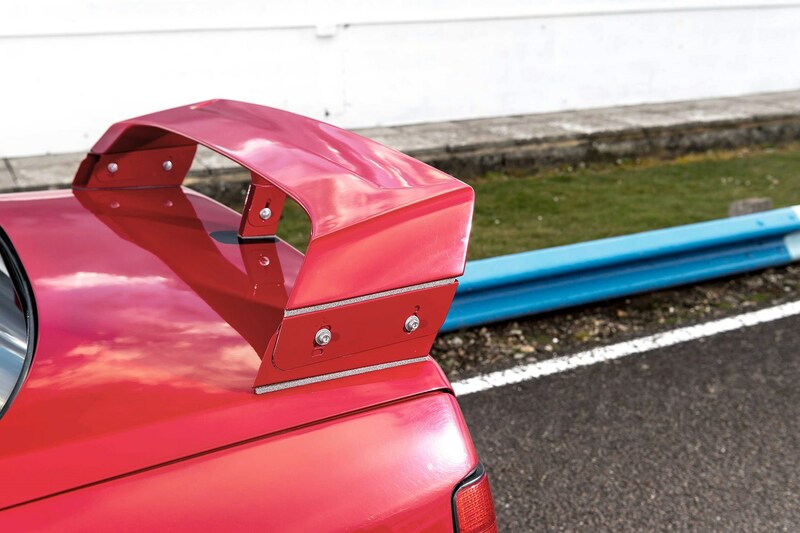 Scott makes me slide my fingers underneath the spoiler and there's a recess – 'for the rear wiper on a 33 hatchback,' he confides, amused by my incredulity that key aerodynamic parts were pilfered from the parts bin. The Silverstone's wing came bolted flush to the bootlid: to raise it, customers had to use the 'lift kit' brackets left in the glovebox. The front splitter was similarly DIY. Of the 2500 produced for homologation, only 248 found homes in the UK, painted strictly red or black with a sunroof the only option. Scott found his six years ago on eBay, up for £350 but haggled down to £50 when he saw the pages devoid of servicing stamps. It had faded to pink, so Scott spent £500 on a respray. He also lowered the body on the 16-inch wheels and attached the lift kit. The 81,000-miler could be worth £7000 now. 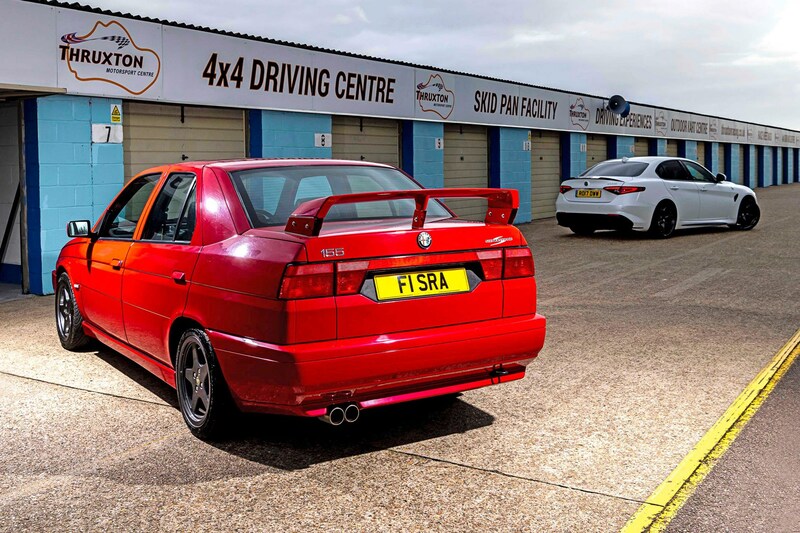 While the Touring Car ran a modified Lancia Delta Integrale engine, the Silverstone is fitted with an eight-valve 1.8-litre Twin Spark producing a mere 110bhp – about a fifth of the Giulia QV's power. And sent to the wrong end: the 155 was developed under new owners Fiat, who abandoned its predecessor's rear-drive. 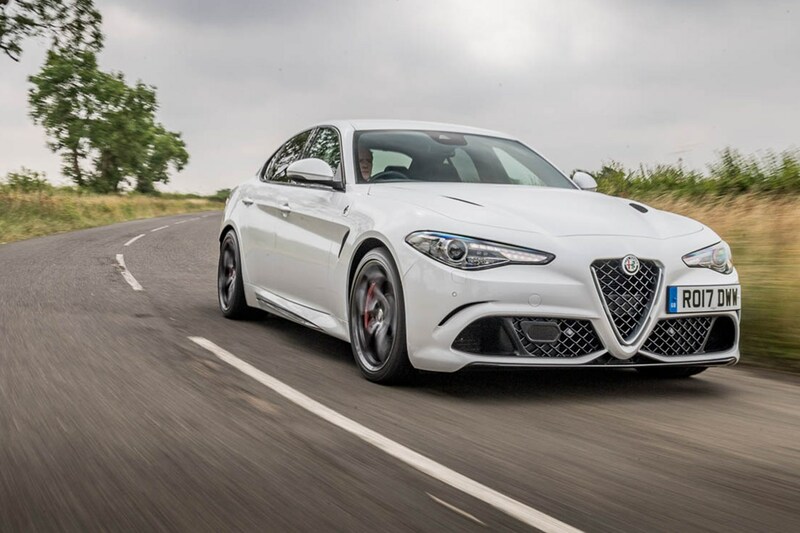 It took a quarter of a century for an Alfa saloon to return to rear propulsion – thanks to a carbonfibre propshaft on the Giulia. 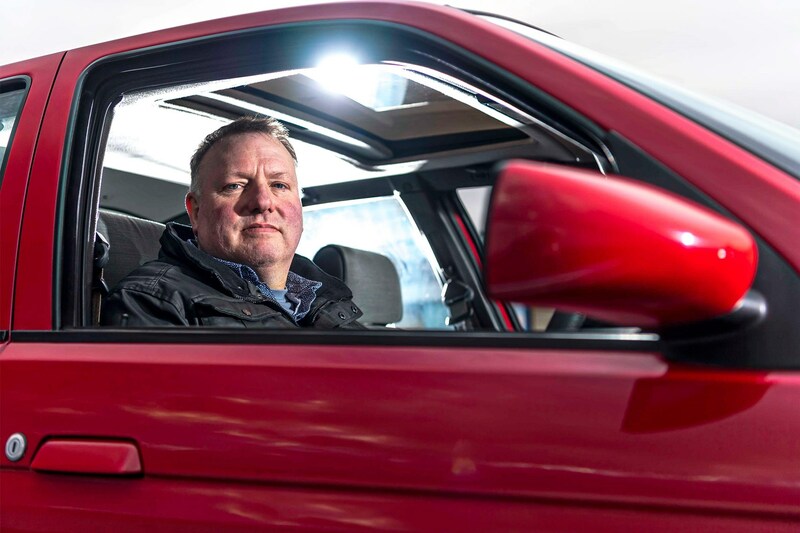 It's definitely not about performance: for that, Scott drives a wide-body 155 fitted with a Fiat Coupe's turbocharged five-cylinder, tuned to 400bhp. Or his 155 V6 race car. Or a Nissan R33 Skyline GT-R which won Ultimate Street Car at Santa Pod. With nine cars, a van and a shed full of go-karts, it's fair to say Scott has the car thing quite badly. 'I've been lying under cars from the age of eight – that's where my love of cars comes from, and the influence of my dad and brother.' He's raced at Thruxton plenty4 of times, and lights up when the circuit's group operations manager, Pat Blakeney, comes over to inspect the cars. Pat was in a regular 155's passenger seat back in '94 when Tarquini drove some 'reasonably quick' sighting laps to familiarise himself with the circuit. 'Proper chap! Neither he nor Simone had raced here before that weekend,' he recalls. They finished 1-2. And an Alfa will be back on the grid when the Dunlop MSA British Touring Car Championship returns to Thruxton on 19-20 May: Rob Austin is campaigning a Giulietta, prepared by HMS Racing. 'Touring Cars has changed enormously since the '90s. It peaks and troughs but it's back on a high,' suggests Pat. He's expecting a 25,000-strong crowd, assuming the weather is kind – which would be a similar attendance to 1994. 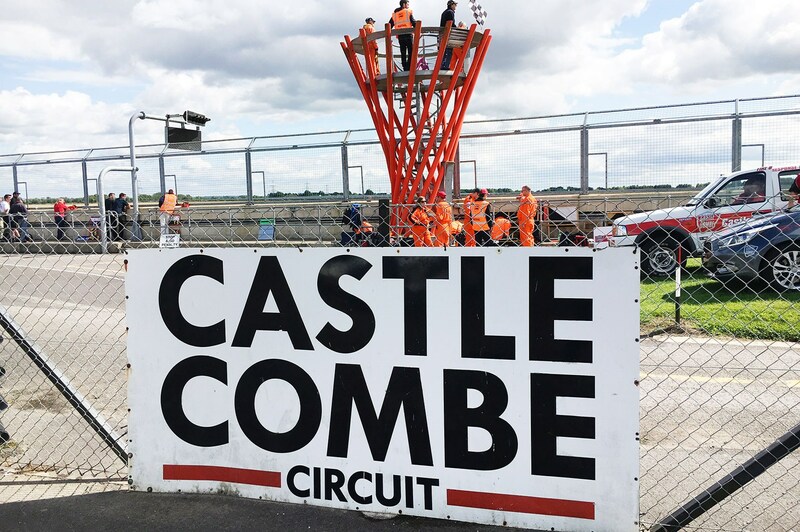 A couple of weeks later, on 2-3 June, Thruxton will celebrate its 50th anniversary with the official opening by Nigel Mansell and Murray Walker of its £2m hospitality centre. It's a big year for the Hampshire Speedbowl. But my thoughts are turning to another circuit, today's final destination: Silverstone, where the 1994 title was decided on the penultimate race weekend. I criss-cross the North Wessex Downs with the Alfa in Dynamic mode, instrument panel glowing red. At the top end, the engine resonates like a hive of bees stuffed into a tin pail. The stiffer damper setting makes the ride uncompromising, like being lashed to a taut trampoline. But Giulia project leader Philippe Krief came from Ferrari and he brought some of its genius with him, including the bumpy road button. One press and it's like unbuttoning your trousers after a particularly gluttonous Christmas lunch: you can almost hear the Alfa sigh as its dampers relax their grip. The downside is more hip-wriggling lateral movement. I cut through Wantage, then Grove, the home of Williams F1, before being spat out onto the A34. At a cruise, there's a rustle of airflow which is omnipresent but not aggravating. Turn the rotary selector to Advanced Efficiency mode, and the Quadrifoglio surfs at 2000rpm, a barely perceptible hum of engine melding with a low-level drone of rubber and the occasional whine from the differential. 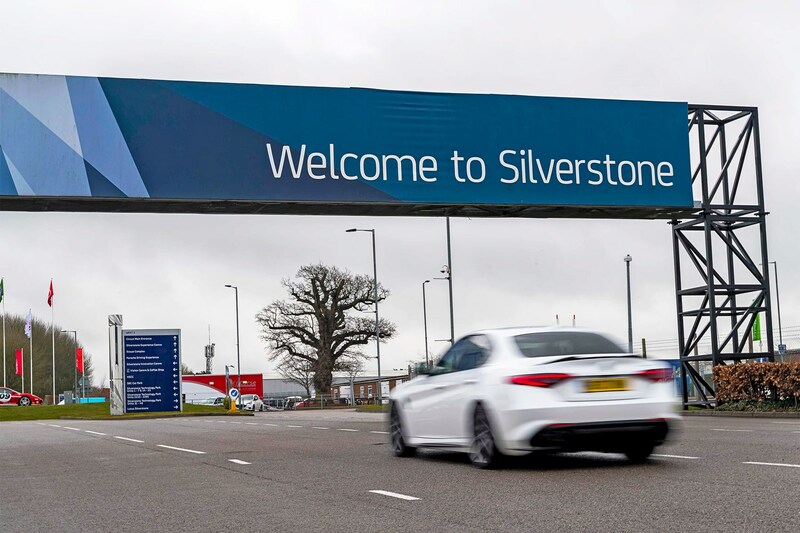 After 100-odd miles in the Giulia, Silverstone isn't far now. A day on the road resurfaces its digital deficiencies, such as no smartphone mirroring and having to glance at the central screen for navigation directions, because the instrument binnacle relays no reminders. But the standard sports seats have proven comfortable as well as supportive, with the lumbar support stretching out my aching lower back. Off the M40, and it's time to string together the A43's stretch of roundabouts. Early on, I go in too fast and clumsily push the nose wide: soon I'm judging entry speed correctly so momentum and grip form a perfect union, inviting me to get back on the instantaneous throttle. Dynamic mode allows a little rear slip too, before the Quadrifoglio locks itself into the next straight and hurtles onwards. Silverstone is silent, the Grand Prix circuit well and truly off limits, so a couple of photographic laps of Thruxton will have to suffice for today. With no jockeying and jostling between Scott's 155 and my Giulia, I have to imagine the adrenaline rush and chaos of being in the thick of a Touring Car race. 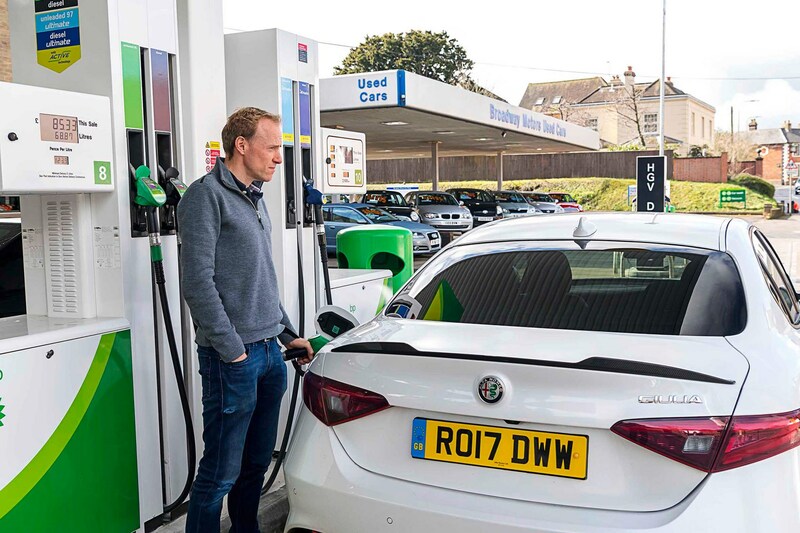 But this lack of action hasn't diminished Scott's admiration for the Giulia Quadrifoglio – it seems to have had the same effect on this Watford Alfisti as the 155 did all those years ago. 'I'd have one in an instant,' he says. 'I just need the £72,000 price to drop a little first...' I know exactly how he feels, and I couldn't agree more. After seven months and nearly 14,000 miles, it’s time for new Giulia Quadrifoglio boots. The rear rubber has worn incredibly evenly but is too smooth for comfort, while the fronts are down to the warning mark. Blackcircles.com doesn’t have the approved Pirelli P Zero Corsas in stock, so I phone Glyn Hopkin Alfa which carried out the 9000-mile service. The 245/35 fronts cost £452 a corner, while the broader 285/30 rears are £538 each. That’s £1980 all in, but dry grip is back to Loctite levels of adhesion. Phil's Giulia goes toe-to-toe with Ben Miller's Audi RS5, you can check out the reportage here. Low temperatures, sharp camber changes plus clumsy right foot can equal twitchy rear end, and standing water can make for an ice-skating feel. But the Alfa taps out clear SOS warnings through its talkative chassis, and Advanced Eco mode nullifies the hair-trigger throttle. Both should get me over the cold spell, though Pirelli Winter Sottozeros are worth considering. It didn't start well. 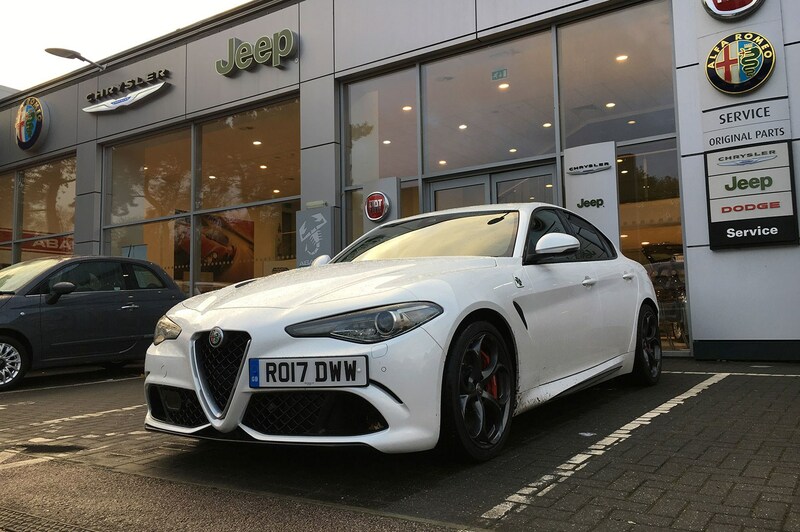 Editor Ben Miller drove the Giulia Quadrifoglio to Donalds Alfa Romeo in Peterborough, for its 9000-mile service. Profuse apologies, but the team weren't trained to handle a QF! It turned out Donalds had left me two mobile messages to try to head us off, but that doesn't excuse the fact they booked in a car I made clear was a QF. Attention switched to Glyn Hopkin's showroom in St Albans, where Alfas rub side sills with Fiats, Jeeps and Abarths. Making an appointment over the phone, I was told there was no possibility of a lift to the station – yet was offered one as I handed the Giulia over to the service desk! I grumbled that my wife was waiting outside. Thereafter things went swimmingly. Not long after lunch the Giulia was ready. The technicians had interrogated the electronics in a bid to discover what had triggered those early engine warning lights, but found nothing untoward with the biturbo V6. However, the brake diagnostics had been disconnected on one corner during a ceramics check at HQ; this was duly patched up. Oil changed, fluids topped, Giuila washed immaculately, and all for £288 including VAT. Damn good value, I thought: the first service on my Discovery Sport diesel was £358. 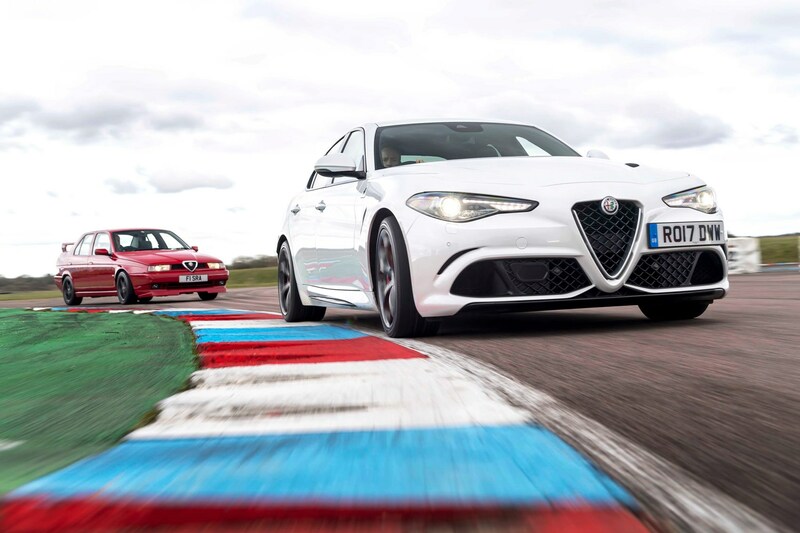 Month 4 of our Alfa Romeo Giulia QF long-term test review: do the DNA modes work? 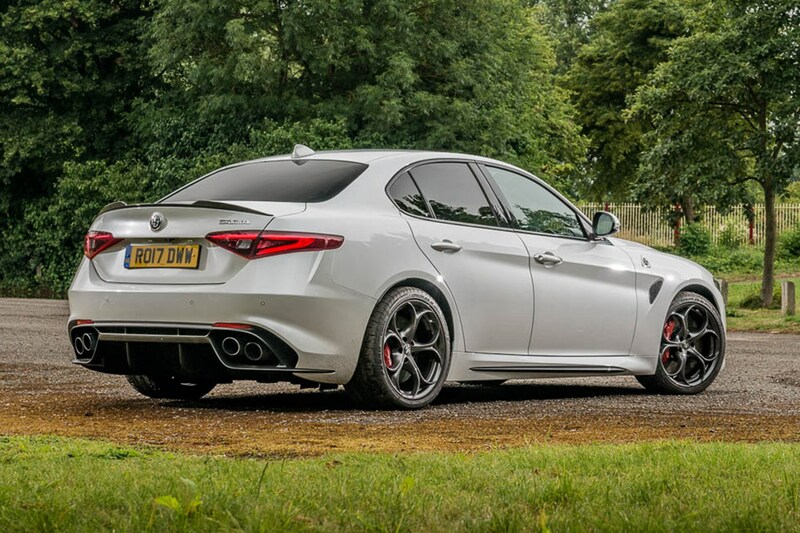 It’s easy to rhapsodise about the Giulia QV’s sensory rush at maximum attack. 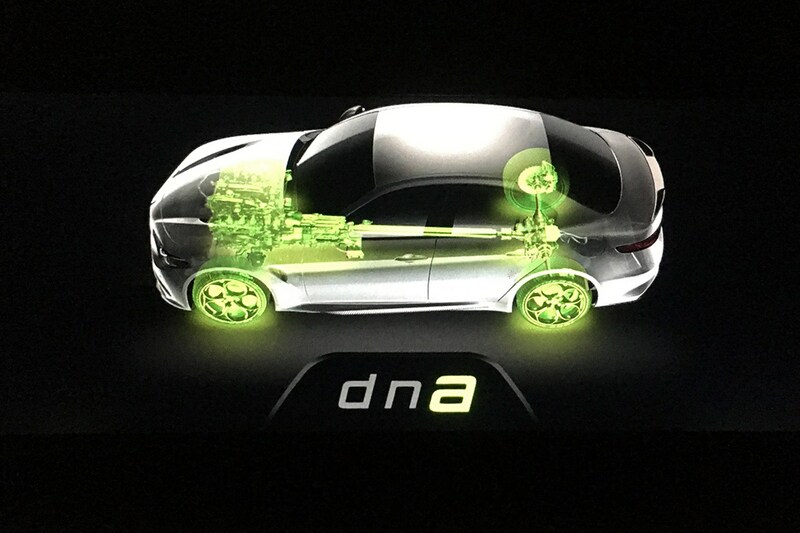 But using its clever DNA Pro control you can switch from Dynamic, past Natural and into Advanced Efficiency and you have a very different beast. The super-responsive throttle basically stops working, there’s a more eager upshift pattern, a cork goes into the exhaust and the dampers relax. Commuting in this mode can get me 30mpg. 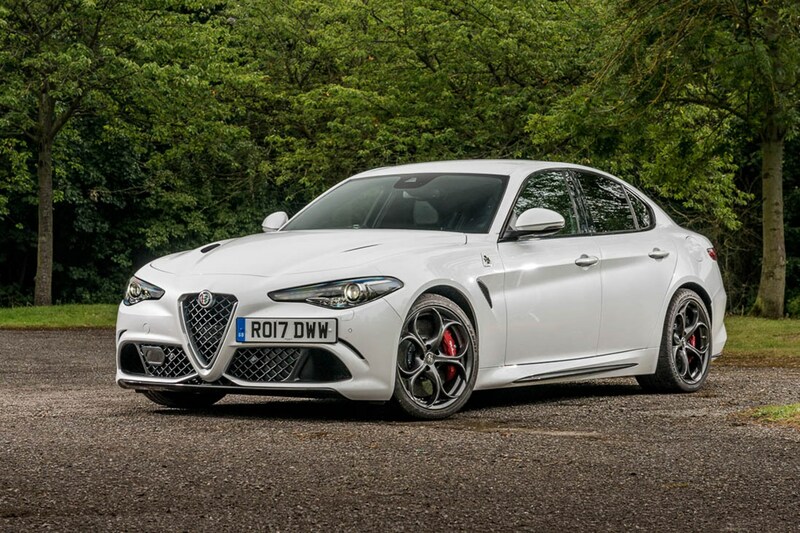 Summer sun, family, classic racing and an Alfa Romeo Guilia Quadrifoglio: it was one of those days that leaves you blissfully satisfied, like simultaneously devouring a box set and a box of Lindor Milk Truffles. 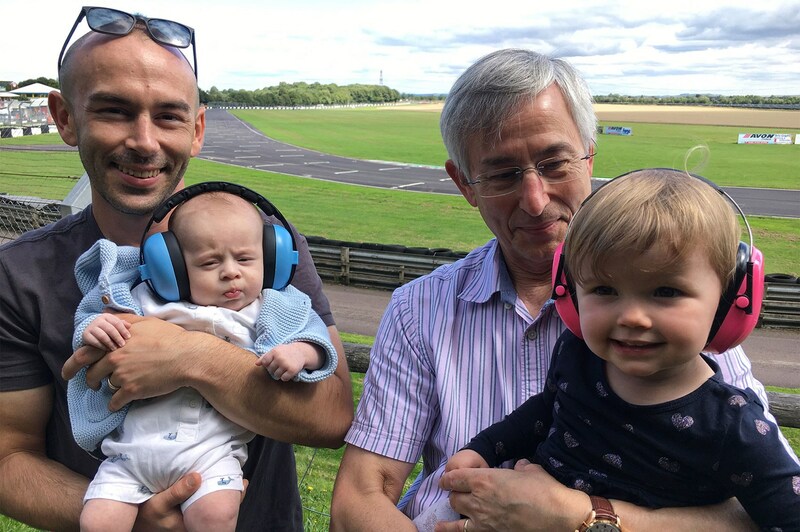 Castle Combe wasn’t just hosting the West Country Cracker Race Meeting, but also a gathering of my motorsport-bred inlaws, including the introduction of two-month-old nephew Ioan and my daughters to motorsport. The Oakhams welcomed the Giulia into the fold. ‘This is the first car of yours I’ve liked,’ said father-in-law Chris, creakily lowering himself into the subterranean driver’s seat and fiddling with paddles that combine a tactile springiness and a percussive click. 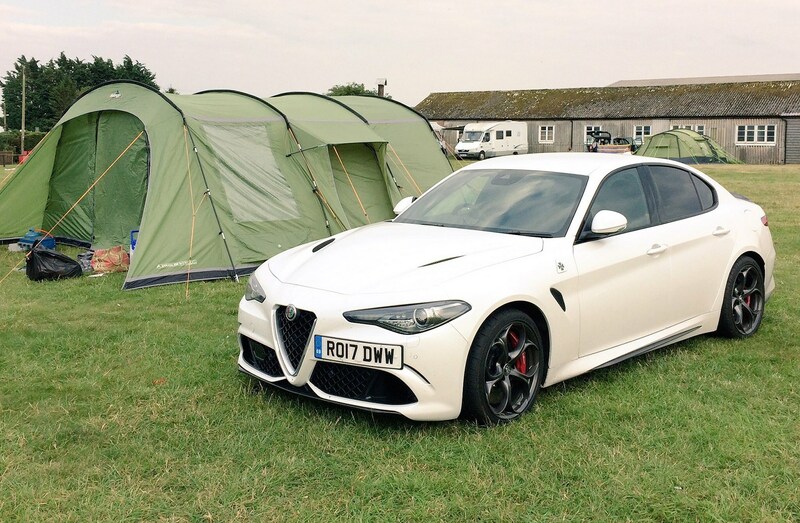 Then, laden with camping chairs and children, we left the Alfa in the Castle Combe car park/field and headed for the action, leaving a gathering of Wiltshire Alfisti to snap selfies while decoding the QV’s air vents and carbonfibre details. Camp corner gives a great view down the straight to the Bobbies chicane, then a swivel to watch the racers negotiate our wide, fast right-hander before gunning it to the start/finish line, all within striking distance of the essential ice cream van and toilets. And the racing got better as the sun grew hotter and the clutches of 99s got digested. The Mini driven by Julian and Matthew Howell utterly dominated the first race, leaving me plenty of time to marvel at the ’60s Alfa Giulia Sprint and GT, their twin-cam fours buzzing them around the track. They looked like the Matchbox saloons I played with as a kid, and weren’t much bigger up close, a good half a metre and perhaps 400bhp down on my car. Next was the Jaguar Saloon and GT championship, which had me reminiscing about Tom Walkinshaw racers and my cousin Mark, who always looked cool smoking around in various XJs. By now the kids were really getting into it, backing the cars with the most eye-catching paint, as a Marcos diced with some Triumphs and Lotus Elans in race three. The Formula Ford championship, taking my father-in-law back to his days piloting Mallock race cars, was interrupted after a big shunt at Quarry. Out came the safety car, appropriately a Civic Type R from the nearby Honda plant, before Josh Fisher charged from sixth to win. Then it was time for the 25-mile drive home. For a cross-country trip like this, the pre-flight checks are simple: pull hollow transmission selector back and to the left to lock in manual mode, and ensure the drive mode selector is in Dynamic to put the exhaust into Pavarotti bellow, the suspension into lock-down and the biturbo V6 into supersonic. Everyone who drives the Quadrifoglio comes back muttering about how fast it is, but it’s also captivatingly mechanical and incredibly sensual. The V6 idles with grumbles and vibrations that rock the driving seat, more akin to the racers we were watching than the sanitised engines that are more commonplace today. Pin the throttle and let the revs climb in every gear, waiting, waiting to pull the paddle. Then there’s what feels like a moment of inertia, of calm, before the cogs mesh and drive is catapulted rearwards again. And, when you do have to back off, there’s the wonderfully evocative chatter of over-run often accompanied by a bang-bang salvo of exhaust gas being dumped. Late afternoon and the B3109 is deserted, so I straddle the white lines approaching corners, every nuance of the road transmitted by the firmed-up dampers, feeling the outboard suspension brace the car and the tyres grip as we swoop into the bends. The hyper-sensitive controls heighten the Giulia’s sense of alertness: the throttle is hair-trigger (a little too much), the effortless steering responds like a sprinter to the gun. If it all sounds near spiritual for me, and damn enjoyable for my game wife too, the kids are deeply ambivalent and fall asleep. Home and there’s nothing better to do but park up and head to the village local. It was the kind of day that would have got Lou Reed composing. Our group MD, who’s owned a string of rapid Porsches but has a passion for Alfas too, borrowed the Giulia for a weekend. He loved the acceleration, found the darty steering a touch erratic – and triggered a warning light. This stayed on for a week, locking out Dynamic mode, and supposedly indicating ‘injection system failure’ or ‘catalytic converter damage’. After it had a few days to recover, I took the QV for a gentle spin, tanked it up – and the light disappeared without trace. 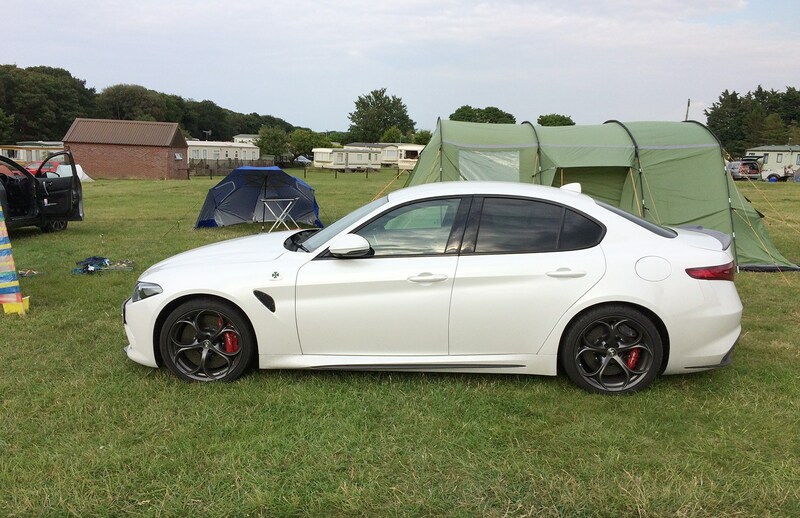 Soon after the Giulia arrived at CAR HQ, I snuck off for a late summer camping weekend away. Not your average family getaway car - but one I relished putting to the test. I'd driven a couple of QFs beforehand, but now we have a Giulia on our daily driver fleet we're all racking up many more miles. And, guess what, we love it! This is finally a compact executive car to draw you away from the Germans, with a fabulous drive, decent quality and (just) enough practicality to stow tents and children and clobber for a weekend under canvas. The drive over to Norfolk was rewarding: the Giulia Quadrifoglio has a really well resolved ride/handling balance, smoothing away the nuggets of East Anglia's finest bumps and lumps, switching to a pointy alertness once we turned off the dual carriageway. And that turbocharged V6 is epic: all 503bhp of it making mincemeat of dawdling caravans, yet playing quiet cruiser when in more relaxed mode. And that's what we want from a car like this, isn't it? A car you can pack your life into for a family weekend away and play sensible dad; yet one that inspires and fizzes with fun when you pop to the local shops for camping supplies. 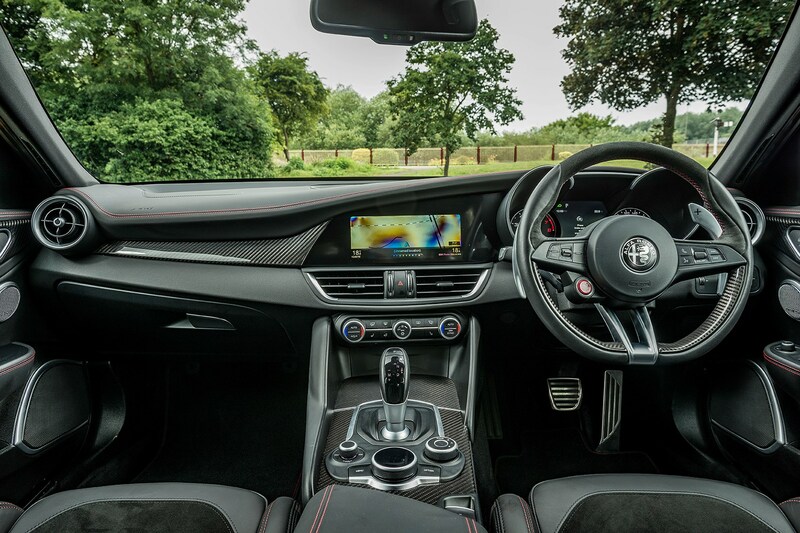 Yes, the interior dashboard quality is a bit of a letdown and the infotainment system lags behind the Germans', but there is an early truth emerging from this test already: the Alfa Romeo Giulia is the best Alfa we've tested for years, probably decades. And the Quadrifoglio is a properly mouthwatering alternative to the M3 crowd. I've gone from running a Seat to an Alfa Romeo, the brand Ferdinand Piëch always yearned to buy when he ruled Volkswagen Group – probably with fatal consequences for its Spanish outpost. But would the VW of Piëch and Winterkorn have created this beautiful demon, the Guilia Quadrifoglio? Not a chance. First up, the Giulia project went from zero to world premiere in 26 months – years ahead of the industry norm. Can you imagine the rational Germans throwing processes out of the window, of taking quality risks by moving so fast? Let alone the fact that there was no compact, rear-drive -saloon architecture in the group. Aha, but that didn’t stop Sergio Marchionne, Fiat Chrysler CEO. Sensitive to two decades of front-wheel drive Alfa duffers, Marchionne plucked engineer Philippe Krief out of Ferrari, giving him a clean sheet of paper and a nightmare deadline to create a BMW rival. To emphasise how rapidly Krief’s tiny team was moving, the automatic transmission changed from a seven-speed Tremec dual-clutch to an eight-speed ZF 'box in the 11 months between the car first being shown and us driving it! 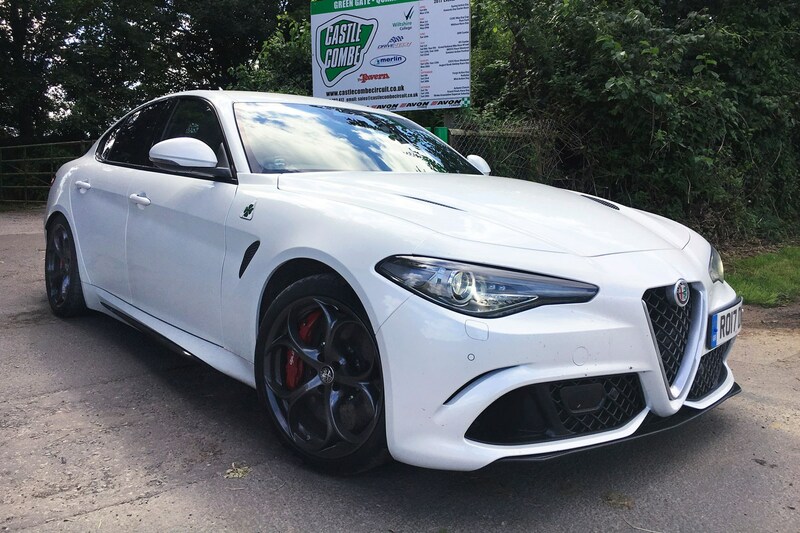 Incredible brinksmanship but with incredible results, the £61,595 Giulia QF is something special. And now the exotic supersaloon, with its carbon bonnet, roof and brakes, active aerodynamics, electronically controlled diff shuffling torque between rubber the thickness of After Eights, is joining our fleet. Rejoice! I know it’s not gentlemanly to talk ill of previous loves, but the last time I had a car this tasty was the RS5 seven years ago, and that was a phenomenal engine marooned in a leaden chassis. Comparatively, the 2.9-litre Alfa sacrifices two cylinders and introduces twin turbos to muster 503 horses and 442lb ft of torque. As you might expect given the project leader’s origin, the blueprint shares some Ferrari V8 commonality, namely the size of its cylinder bores and the 90-degree vee angle to lower the engine mass. 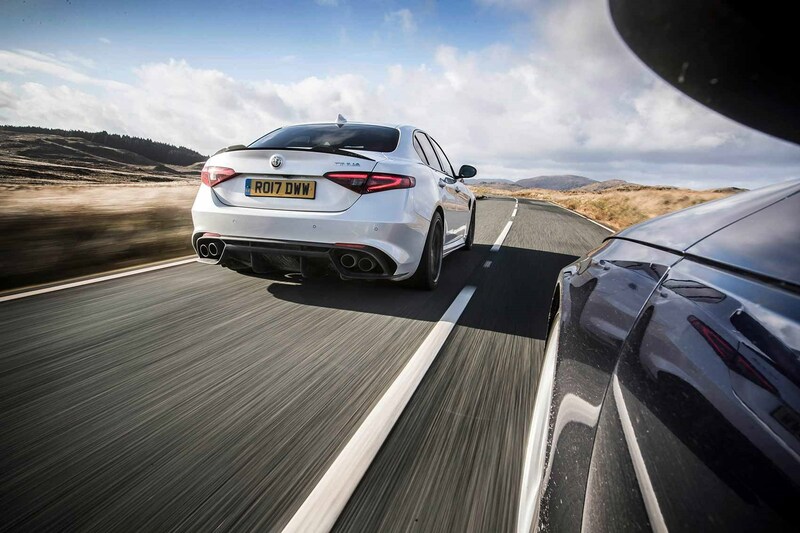 And when you bury the throttle, the Alfa piles on speed faster than you can wail ‘Ferrari’: this is one breathtakingly quick car, no slouch even compared to a Maranello cousin. 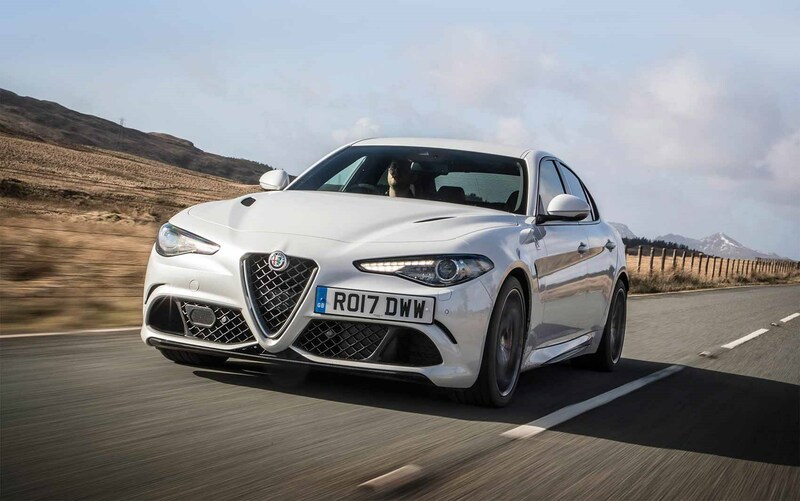 Thanks to the standard DNA Pro adaptive chassis dial, you can have your Giulia in suavely speedy or screamingly speedy, depending on whether you’ve selected Natural or Dynamic mode. And there are two more flavours to boot, Advanced Efficiency and Race. More in future reports, but first impressions are that the Giulia, with its taut but supple ride and civilised exhaust, can cruise as well as hoon about. 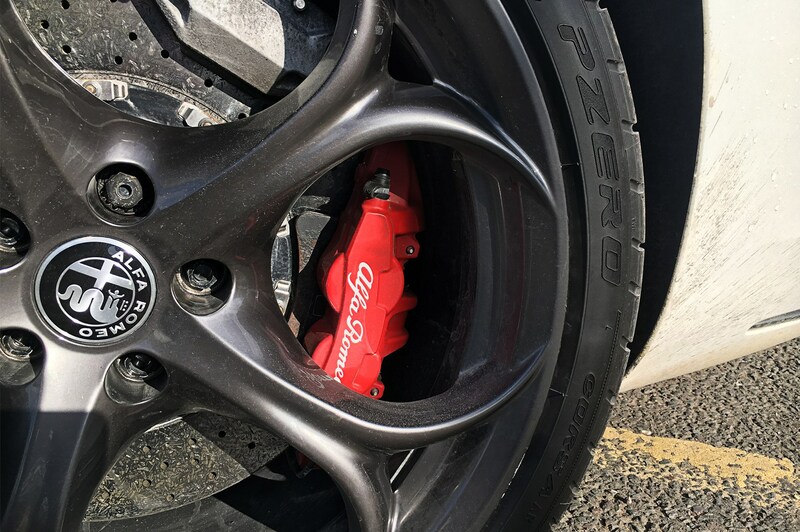 But the carbon ceramic brakes, a £5500 option, clamped by calipers finished in £250 of red, have a mind of their own. They allow the Giulia to creep, creep, creep from stationary, unless you give the pedal an unholy press. Within seconds of her first trip in the QV starting, my wife upbraided me for intimidating an oncoming car, when I was merely trying to rein in the runaway Giulia. The other big option spend is cosmetic: £1950 for Trofeo White tri-coat paint. Those beautiful dark throwing star alloys, a modest 19-inches in diameter, cost £350, rear privacy glass £275. And the interior upgrades comprise £225 flat-bottomed steering wheel in alcantara, £950 on heated, electrically adjustable seats, keyless entry in the £425 convenience pack and £950 Harman Kardon stereo.